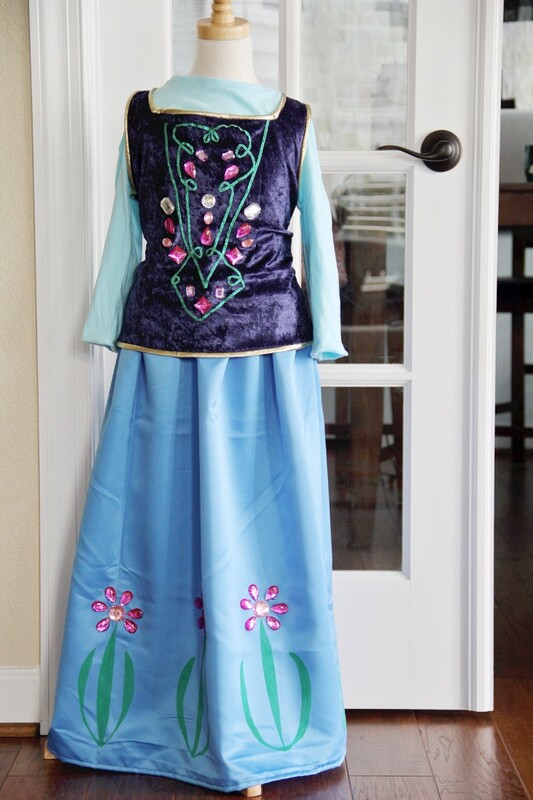 As promised in my Elsa Dress DIY post earlier this week, I give you the infamous Anna dress costume. 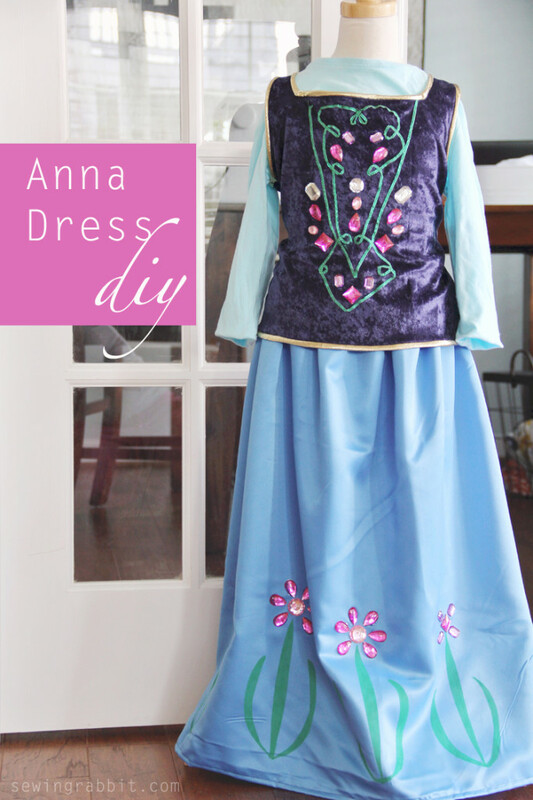 Anna’s movie dress requires a lot of detail work, which doesn’t make sense to toil hour after hour on embroidery for a children’s costume. In order to achieve a similar look to Anna’s dress, I needed to get creative. 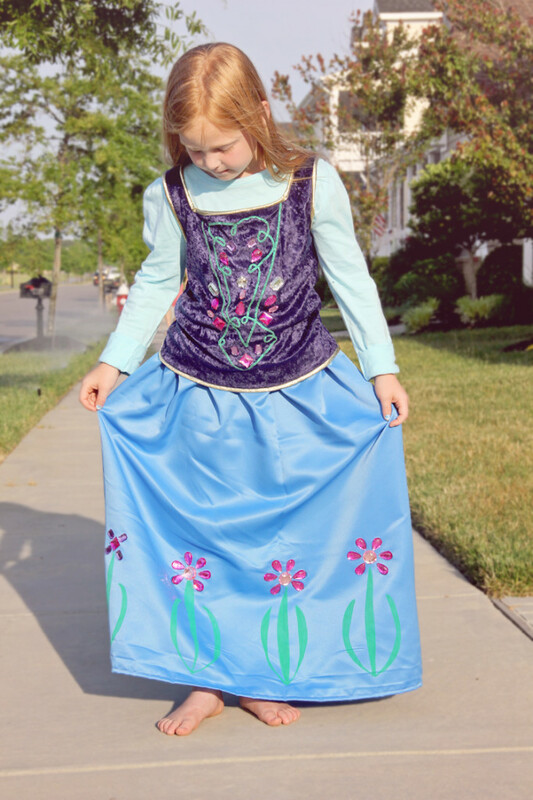 With some ribbon, fabric paint markers, and fabric glue – I believe we achieved the perfect kids Anna dress DIY. Something that is obviously Anna, yet much easier to create. So let’s go. 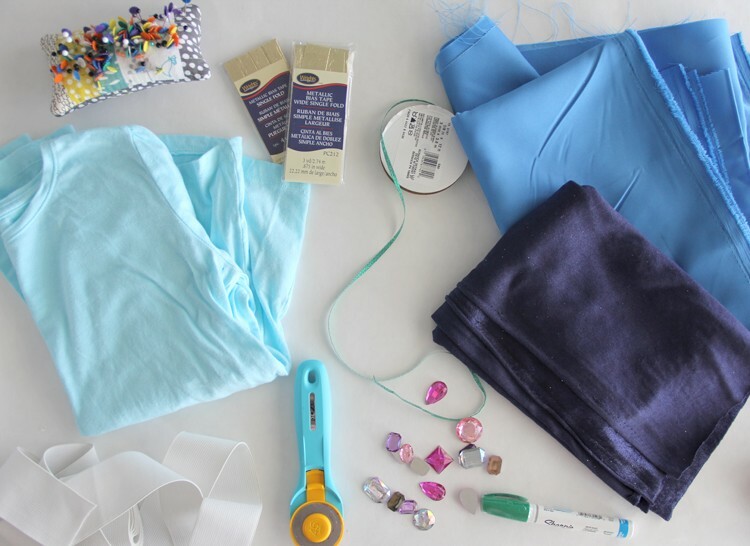 Lay your Blue T Shirt down to use as a basic pattern piece. 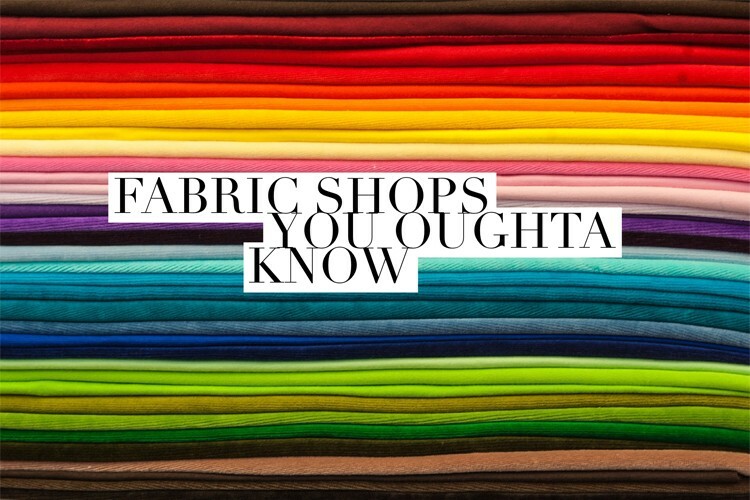 Place the velour fabric on top of your T Shirt, on the fold. Cut around the side seam, armsyce, and the shoulder seam, adding desired seam allowance. For the neckline cut a square neckline. Cut (2) for Front and Back. If desired, cut the front square neckline lower than the back. Now its time to have some fun with the ’embroidered’ bodice. Using your green ribbon, pin it strategically around the front of the bodice. 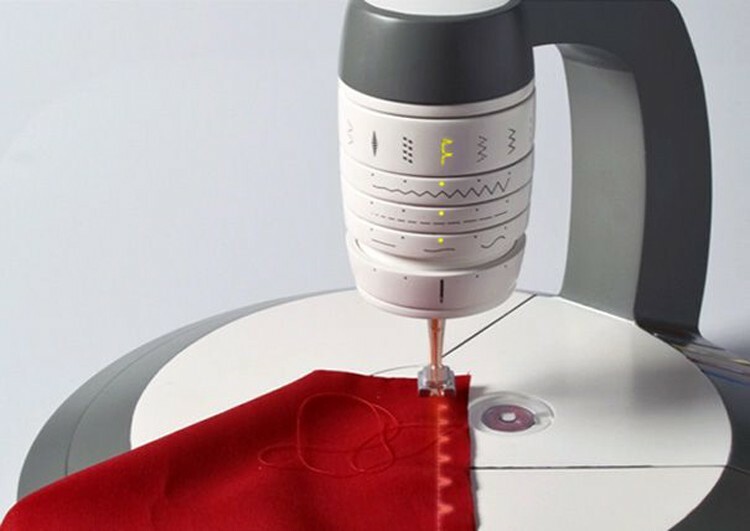 Sew the ribbon directly onto the front bodice using a zig zag stitch, following and pivoting with the sewing foot as you sew. Add jewels or flowers directly onto the bodice using fabric glue. Allow time to dry. We will now work with our gold bias tape. 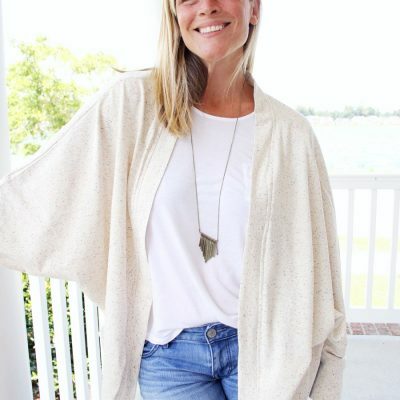 Sew your gold bias tape around the neckline, pivoting at the square corners, going from one shoulder to the other side. Sew in fold, and you should have this. Fold over bias tape to the wrong side of the neckline, covering the raw edge neckline, pin in place. Sew, making sure you catch the other side of the bias tape as you sew. Repeat for both front and back bodice. Place front and back bodice right sides together and pin shoulder seams. Sew. Sew bias tape onto both armsyces. Fold shirt right sides together, pin and sew side seams. Add bias tape around the hem. 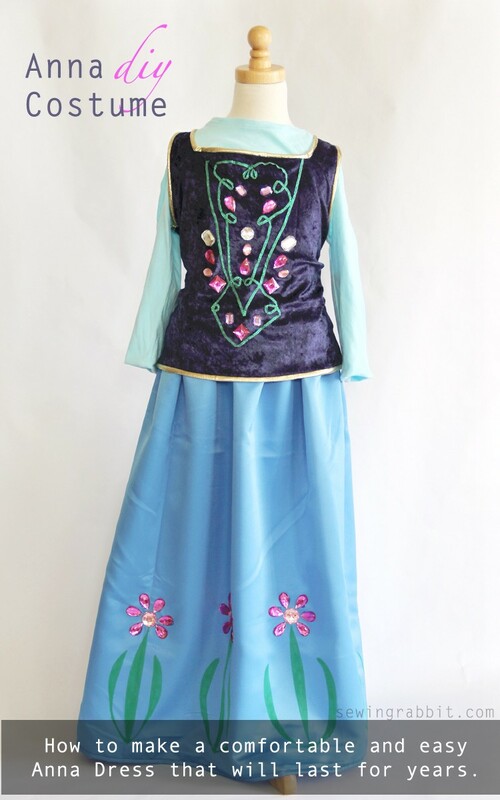 And you are finished with the top half of your Anna Dress! Measure your child from waist to floor, this will be your skirt length. Cut (2) skirt panels your desired length x 30″ wide. Place panels right sides together and pin side seams. Sew. Measure your child’s waist and subtract 2″. Cut a piece of elastic that measurement. 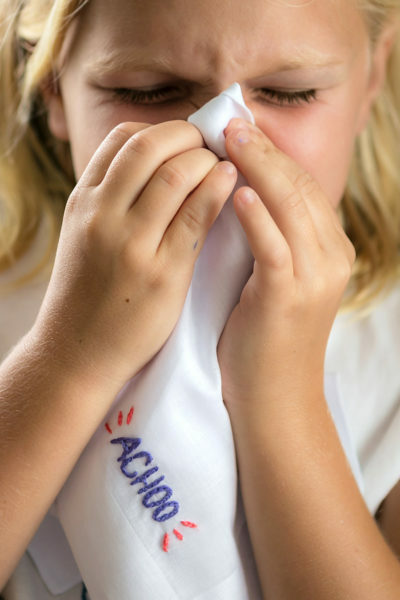 Place short ends of elastic together and sew, creating a circle. Flip the waistband up, and you have finished the main skirt. Now let’s embellish Anna style. 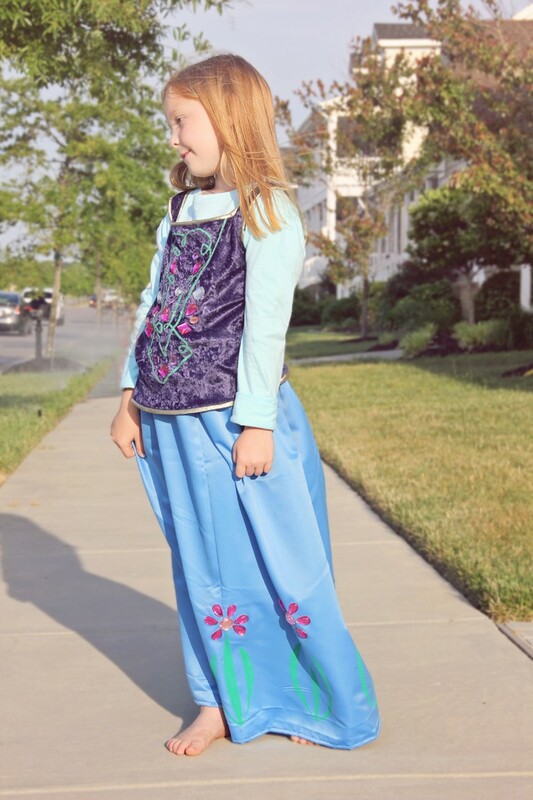 Using fabric paint or a fabric paint marker, draw flower shaped designs around the hem of your skirt. I made a basic tulip style stem and leaves. Allow time to dry if needed. Using fabric glue, place the craft jewels or flowers around the skirt in desired places. 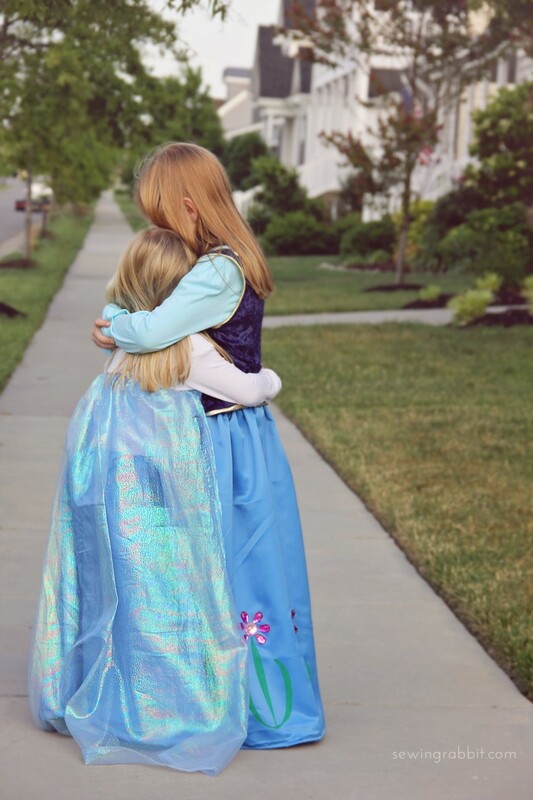 Make sure to check out the Elsa Dress DIY here for the coordinating costume! My daughter would PASS OUT if she saw this. How fabulous! So excited to see these, I’ve been looking online for both dresses for my granddaughter and they are either out of stock or unaffordable! I’ve seen several renditions on Pinterest, but yours are closest to those on the movie. Anxious to get to the fabric store and get started! My little Anna will LOVE THIS!!!! 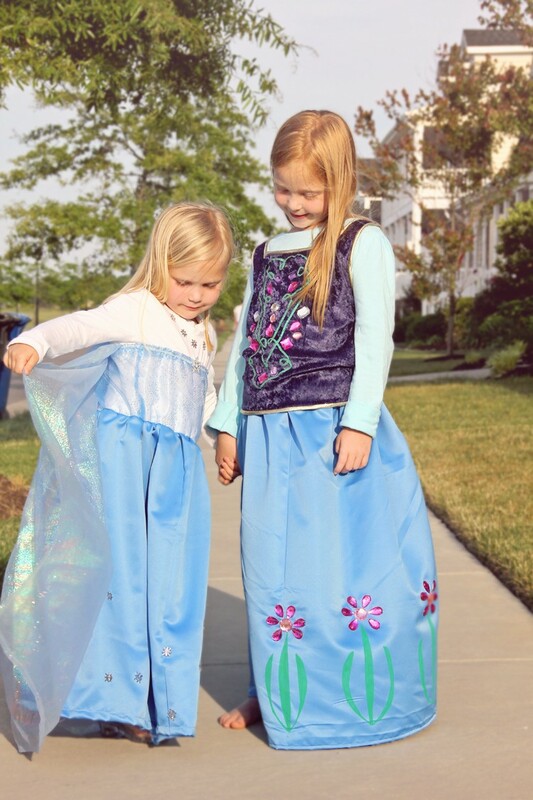 She’s near obsessed with frozen, especially that her and Anna have the same name. Thank you!!!!!! !